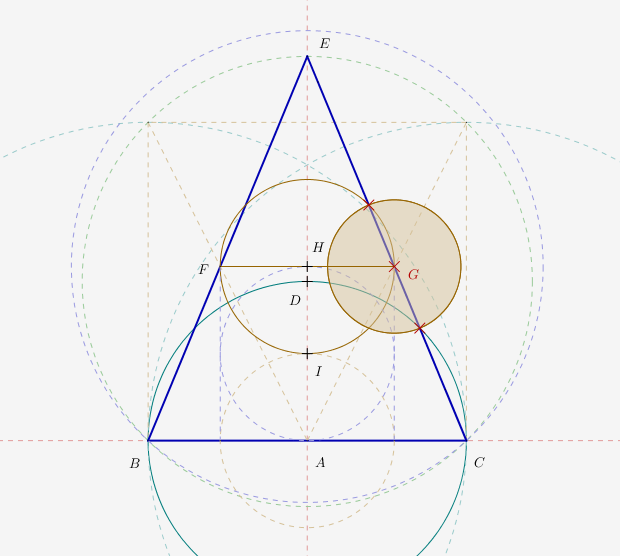 The following is an interpretation of the geometry in Emblem 21 of Atalanta Fugiens. My contribution, including all the mistakes, is covered by a Creative Commons copyright licence, which is very liberal regarding reuse. Please respect the conditions of that license. Details on the bottom of the page. Atalanta fugiens is a book written by Michael Maier (not him, the other one) in 1617. It is composed of 50 drawings, with an explanation and a song for each one. The drawings are fantastical engravings depicting mythical events. 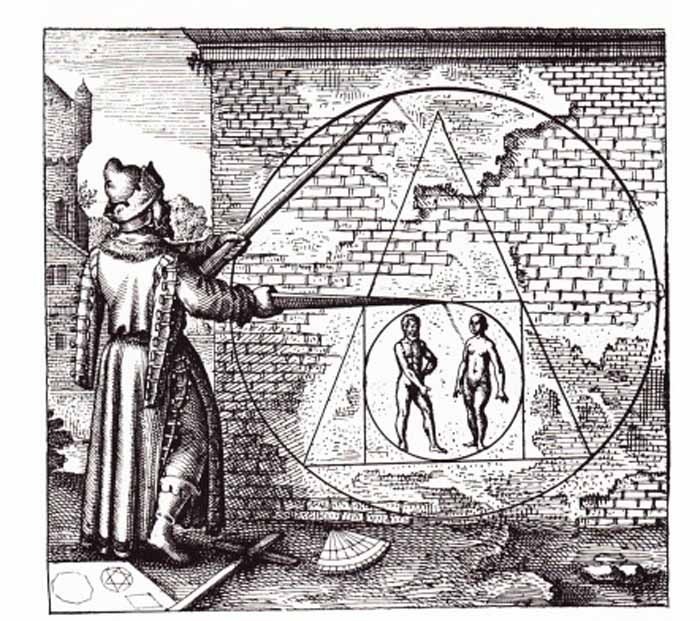 The main theme of the book is Alchemy, the creation and transformation of matter. 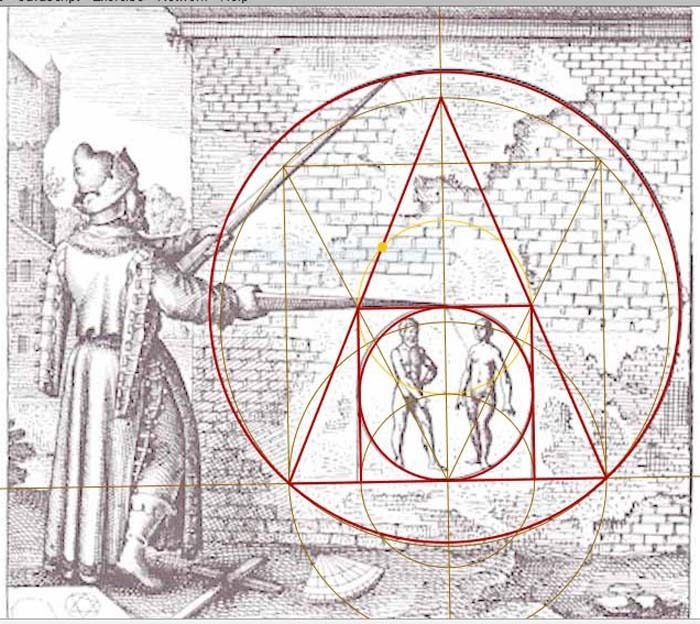 Emblem 21 is a drawing of a man with giant compasses constructing a drawing on a rough brick wall. 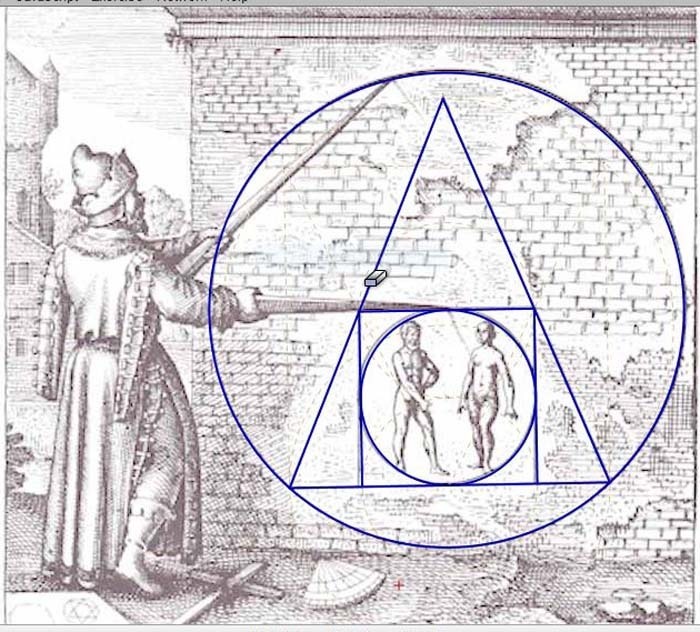 The drawing is apparently the secret to the Philosophers stone. The book is much studied, being an endless source of interpretation on alchemy and mythology, with music. Even a multidisciplinary team studying the book and its music. These people sing the "fugues" from the book. Emblem 21 interests me because I recognise the geometry, or at least I think I do. This is my interpretation of it based on the beginning construction I usually start with in my own studies. Its very simple, and it seems to fit Emblem 21 very well. 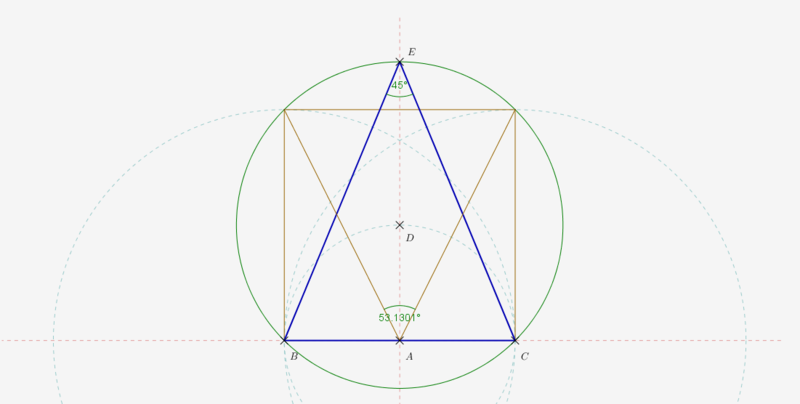 The geometry is, as always with me, compass and straight edge only. 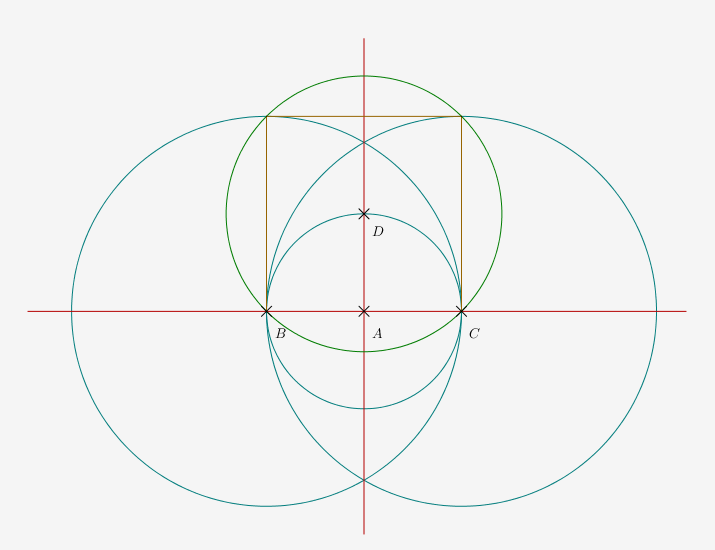 The first step is to construct a vesica on a line, around a contained circle, like so. 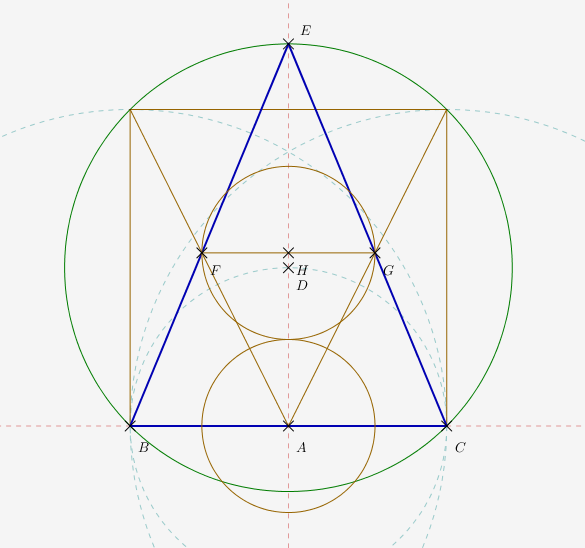 Where the centre line cuts circle DB at E is the apex of the triangle in Emblem 21, which is now revealed as a 45 degree triangle. 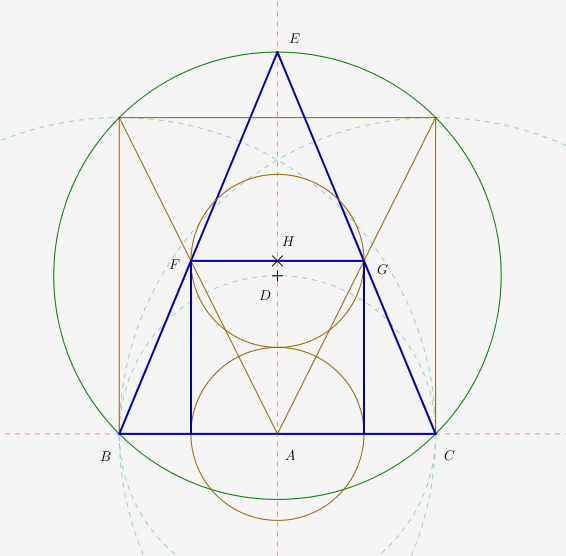 This matches the Octagon on the paper in the bottom left of Emblem 21. 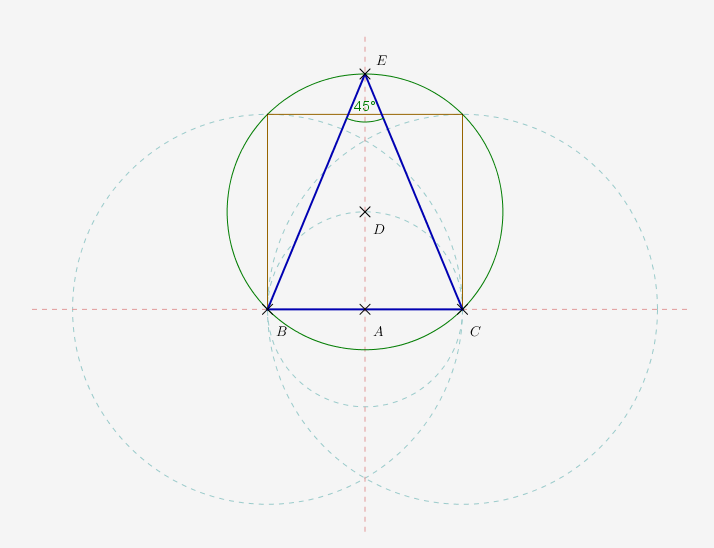 Next, join the corners of the square to point A, forming an upside down "triangle in a square"
Where the upside down triangle cuts the upright triangle at F and G, join with a line(this is the top edge of the square in Emblem 21) Where this line cuts the vertical centre line is the centre of circle HG. This circle is important later on. Keeping the same setting, transfer circle HG to A. The square in the triangle can now be completed, as shown. The drawing can now be completed. 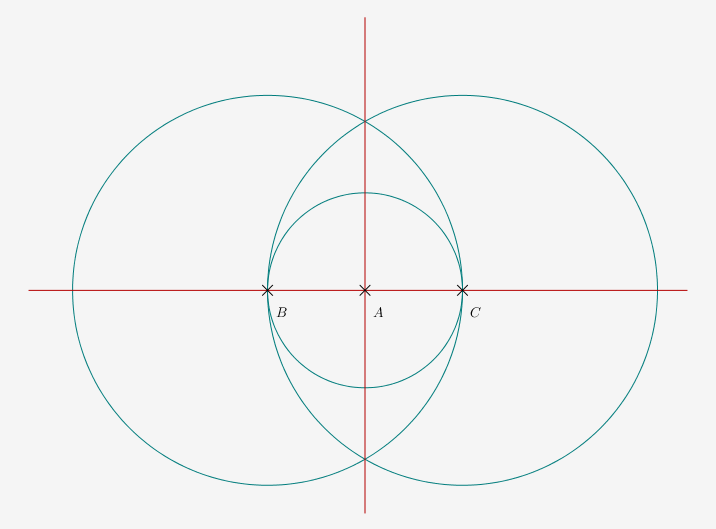 The outer circle has centre H and radius B or C. Inner circle has centre I radius A. 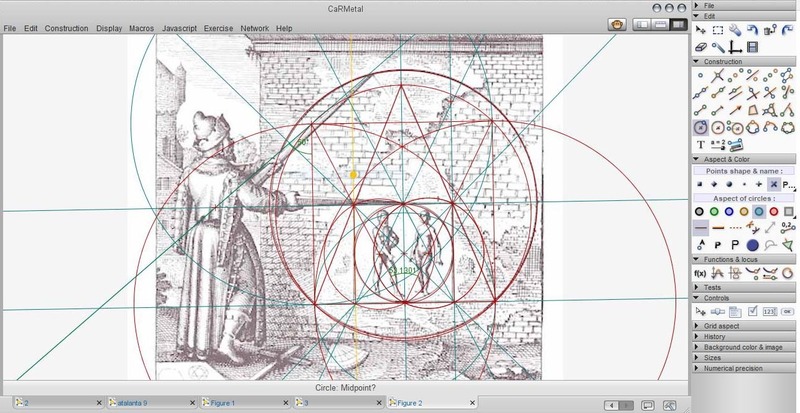 The geometry overlaid with some of the construction lines left in. There seem to be two different styles of drawing in Emblem 21. The figure holding the compasses and the castle and foreground appear to me to be very well drawn, accurately proportioned and nicely finished, whereas the wall is a bit rough and ready, with poorly proportioned and wonky brickworkcourses. The lighting appears to be coming from a slightly different direction too. The geometry itself is tilted about a degree or so anticlockwise, its offset to the centre of the wall, and the inner and outer circles are offset from each other as well. The inner square is also not too square either. It's almost as though it was drawn by two different people. This is how it looks in the C.a.r metal program. The background image is a jpeg. I wasn't able to get the program to save the background and the overlaid geometry as one image, so it was saved as a screenshot, and then cropped and resized in photoshop. As always with this kind of geometry, there are further trails to follow. 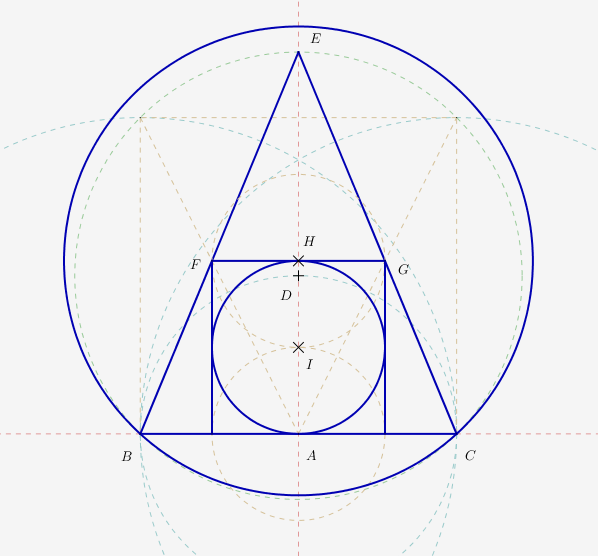 The infilled circle here joins circles HG and AC to the triangle leg as shown. The inner square makes this possible. Clicking the above Icon will take you to the Creative Commons website where a full explanation of the Freeshare Copyright licence can be found.